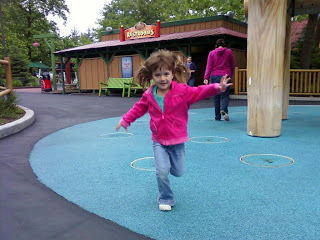 Sunday we took Alyce and Luke to Six Flags. It is Luke's first trip ever and the first time this season for Alyce. Another first for Alyce is that she got her first season pass. This is the first year that Alyce was old enough to need her own pass. It was also her first ever picture id. Getting the season pass was the first thing we did once getting inside the park and Alyce seemed pretty excited about it. The first ride we rode was the Enchanted Carousel. It was close and a good introduction to rides at Six Flags. Luke was even able to ride the horses even though Mom had to be there to hold him. 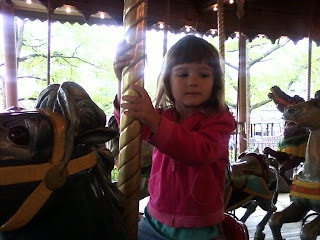 After the Carousel Alyce played on the playground. This was also the first and only ride that she couldn't ride on because of her height. The two biggest and best slides available were only available to kids 42" and taller. Can you believe it? You have to be 3'6" to ride a slide? Before we got busted on height Alyce and I managed to go down the slide so she got the experience. Hah! Take that height checker. After the playground Alyce rode all manner of rides in the Looney Tunes kids area. Some rides she was very excited to go on and others required a bit of cajoling. The balloon ride and the the boat ride were her two favorites while the plane ride was her least favorite. The best part about the majority of these rides is that the parents get to go one them too. They aren't anywhere near as exciting as an adult ride but Alyce's excitement was so infectious that was impossible not to have a good time. Toilet training continued even at the park. 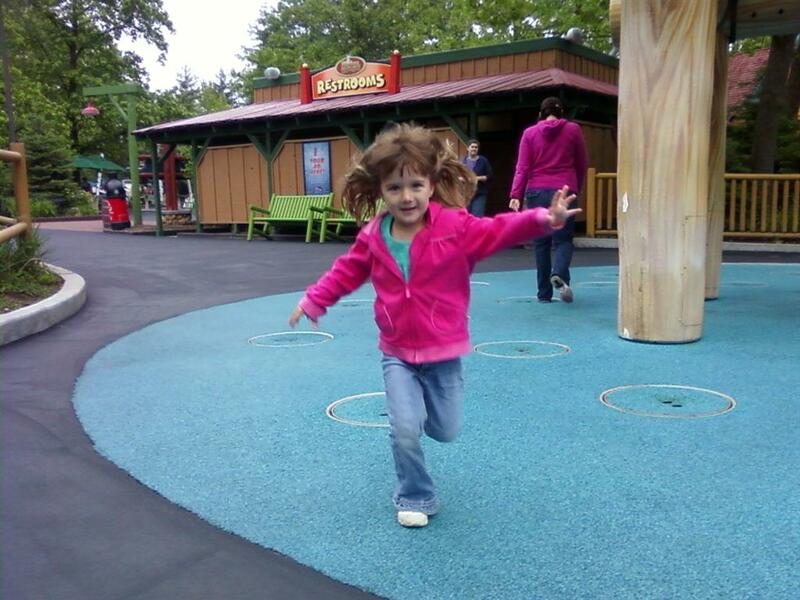 Alyce was a big girl and told Mom and I she needed to use the restroom and didn't have any accidents. Upon exiting the restroom I caught this great action shot of her running into my arms. I love it when she runs into my arms. I pick her up above my head, swing her around, and we come to rest in a big bear hug that I want to hold as long as possible. The last ride we rode for the day was the steam train. The kids area is right next to a train station and the train came through more than once while we were there. Alyce noticed this and asked repeatedly to ride the train. We figured we could do it last and ride it back to the front of the park. Before the train left the station I hopped off real quick to get a picture of Alyce. Alyce voiced her displeasure with my actions by saying "daddy get on the train it's going to leave without you". Adorable. This was also Luke's 2nd and last ride of the day. Had the Ferris Wheel been open we could have gotten Luke on three. Luke was an angel during the whole trip. He spent most of his time in his stroller but he didn't seem to mind except when he got hungry. I'm thinking he was too busy taking in all the action going on around him. 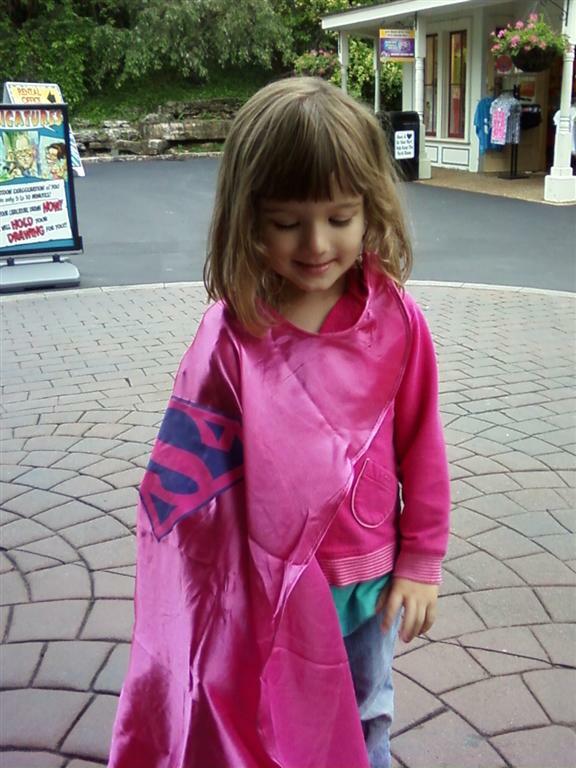 The last thing we did before leaving the park for the day was to pick up a cape for Alyce. Mom and I on previous trips to Six Flags say kids and adults wearing superhero capes. Rather than wanting one for ourselves we knew that Alyce would love one. 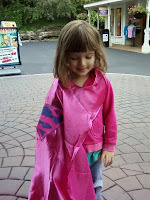 So as we were leaving we were $5 poorer and the proud parent of one super girl and owner of a pink super cape. It will need some hemming to fit perfectly but we know a few people with a sewing machine.